Are you a zucchini fan? It seems like everyone is this time of year. It's zucchini season, so enjoy it while it lasts. I am pretty sure you will love these zucchini pizza bite. You just need a few simple ingredients and 6 minutes in the oven. If you are watching your portion control, then this is a great recipe for you. And if you are craving pizza, this will for sure satisfy your cravings in a healthy way. Turn on the oven to broil- high. Slice zucchini, about 1/4 inch slices. Spread zucchini on a baking sheet. Spread marinara sauce on each zucchini slice. Sprinkle mozzarella cheese over the sauce, leave half of the top for the tomato. Slice 4 small tomatoes and place 1 slice on each zucchini. Sprinkle the rest of the cheese over the tomato. Broil for 6 minutes, or until the cheese is melted. 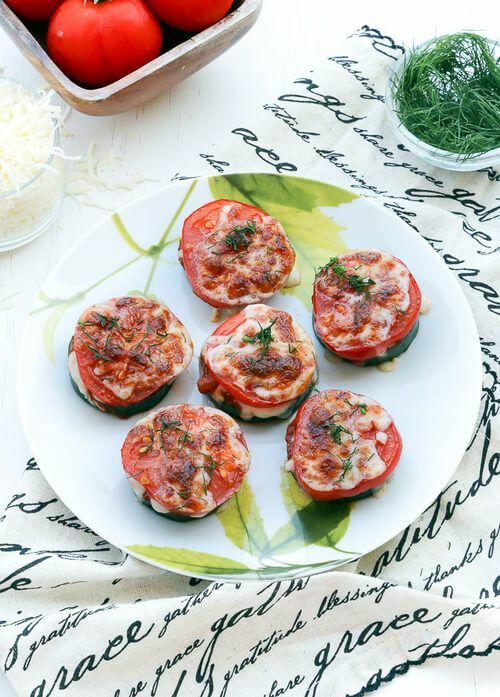 Take zucchini pizza bites out of the oven, sprinkle with fresh chopped dill and enjoy!